Eternal Haunted Summer: If you could correct one common misconception about polytheism, especially Hellenic polytheism, what would it be? Chris Aldridge: I would change the misconception that our religion is the same as our mythology. It’s a common mainstream notion that the Gods are their myths, and it’s just not the case. True, there are accurate descriptions of the Gods and their attributes within the myths. There’s even real history. For example, we now know that Troy existed because we’ve unearthed it following Homer’s writings. But by and large, the myths do not stand as literal facts, even if they are based on actual places or persons. A myth is something that anyone can write at any time and for any reason, but it doesn’t necessarily make it true. For example, if you and I lived in ancient Greece as servants of Apollon, and I suddenly died mysteriously after forgetting to give Apollon His daily tributes, you might say that Apollon struck me down with His arrows for my negligence. When in reality, my unhealthy eating for the last 20 years has now caused my heart to fail. But the religious aspect is the only way you have to explain it, thus is formed a myth. So I would correct the notion that the myths and the Gods are one. I’d also like the public to stop thinking of us as outsiders. We’re workers, soldiers, parents, leaders, voters, customers, property owners, families and patriots just like everyone else. We just have a different religion, and it’s a great religion that should join the ranks of mainstream recognition as a religion. And fortunately, I think we’re getting closer to that by the day, but there’s still progress that needs to be made. EHS: You just released your first poetry/prayer collection, New Prayers of Old Hellas. How did you come up with that title? CA: It occurred to me that, while we have numerous prayers or hymns from ancient times, we are lacking in modern development in that field. If we are to bring the Hellenic religion into a modern standing, then within reason and Hellenic standard, we should try to create some new things. And so, I called my prayer book New Prayers of Old Hellas as a reflection of that effort. It is to say that these are new prayers of the old country, the old ways, and the old Gods. These new writings are a continuation of the old religion. EHS: In the Introduction you state: “Prayer is one of the central practices of Hellenism [….] each word is sacred, powerful, meaningful, and connects you with a God, Spirit, or Hero. Prayer’s purpose is to create a life-long, spiritual connection […. ].” So, how do you pray? Do you have a set ritual or is it more spontaneous? CA: Prayer is most certainly one of the central practices of Hellenism. I have never seen nor performed any rite without it. It asks for the attention of the God, Spirit or Hero to come to you or the festivities. In regards to myself, I have both set prayers and spontaneous ones. In my daily rites, I go through a standard worship which includes prayers that are already written. However, throughout my day, I may find a reason to pray to any given divinity for help or assistance, or even to just give thanks for something good in my life. The more one learns about the Gods, the more they will be able to do prayers for any given situation at any moment in time. EHS: There are prayers for a wide variety of Hellenic Deities in your collection. First, how did you decide which prayers to include? Were any left out which you hope to release in a future collection? CA: My prayer book in question starts out with The Dodekatheon (The Twelve Olympians), then goes into other important Hellenic Deities that are commonly known. However, in this book, I wanted to introduce the reader to Deities, Spirits and Heroes they may not be familiar with, ones that are of course very important, but that are also not as talked about in modern society or perhaps even in certain Hellenic circles. These are very relevant to our Hellenic practice and our daily lives as Hellenes. But of course, my book does not include all. I do, however, plan to release future volumes of the book in which I intend to include newer prayers that were not in the original. EHS: What is your writing process? Do you meditate, or go for long walks, or curl up with a big pile of books? CA: I generally like to sit at my desk and flip through books that I find appealing to the touch. It’s a bad habit because I have literally destroyed very expensive works doing that repeatedly for hours and days and months at a time. But it helps me think. I will usually go through a gradual process of mental construction. That is to say, I will write one part, then think and wait until my mind comes up with the next. The shower is also a great place to come up with new ideas. EHS: I have heard from many poets that, while some poems come easily, others are very difficult to bring to life. Which of the prayers in Old Hellas were the most difficult to write? Any idea as to why? CA: I would say the lesser-known Deities were the hardest to write numerous prayers for, simply because there are not that many stories about them, or history. Mostly when you learn of Greek religion, you learn about the most dominant Deities. You don’t normally hear of Epione, Harmonia, or The Litai, for example. So it’s most certainly something that you spend more time researching and more time praying and meditating over. EHS: Dozens of different Deities are represented in Old Hellas. Did you set out to write poems for particular Gods and Goddesses, or were you inspired? Did some of the spirits who popped up surprise you? I wouldn’t say I was surprised by any of them. I certainly found new personal connections later on in life, such as with the Hero Bellerophon. But I really just wanted to pack as much prayer information in there as possible and to create a work that had a good sampling of Greek divinities in it. EHS: If a reader is curious about the Gods of ancient Hellas, which poets and poems would you recommend? Both old and contemporary writers? CA: I would most certainly recommend old and modern writers. The Orphic Hymns and Homeric Hymns are wonderful, and I think I am even starting to become a fan of Sappho, as I have begun reading her works, or what’s left of them. As far as modern writers, I would recommend based on the path that one wanted to pursue. If they wanted traditional or reconstructionist Hellenism, then the field would become more narrow because a lot of the publications in mainstream Pagan society are from Neo-Pagans, and Neo-Paganism can contain a lot of personal beliefs and practices that are not necessarily ancient Greek in nature. 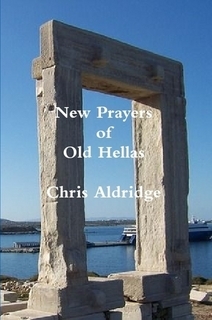 EHS: You self-published New Prayers of Old Hellas through Lulu.com. First, why did you choose to self-publish? And why did you choose Lulu.com? CA: Sometimes I like to self-publish because I enjoy having complete control of some of my own works. There’s a certain level of pride that comes with being able to forge your own way. I can also change and reissue a work whenever I like. I chose Lulu because they are an honest company, have always treated me well in the past, and are based in my home state. EHS: What advice can you offer to other authors who are considering self-publishing? Things they absolutely must do? Mistakes and pitfalls to avoid? CA: The first thing one should do is stay away from predatory publishing companies, whom I have also fallen victim to in the past. If a company ever wants to publish your work for obscene amounts of money, don’t do it. You’re just going to be their customer, not an author. And you might even have a hard time getting your book into stores or even getting it any real attention from the writing community because everyone will know you were published simply because you paid. Even if a company doesn’t want to charge you anything, still do research. There’s a great site called Predators and Editors that all writers should visit. As far as writing itself, just make sure you do extremely rigorous proofreads to root out any misspellings, typos, or errors. I’ve had them in my books in the past because I didn’t spend as much time as I should have reading over the manuscripts. Make sure your writing flows smoothly and is easy to understand, as well. Don’t be too wordy and don’t over explain or get off subject. Lastly, don’t be boring. Captivate with the first sentence. Give your words impact, feeling, and even use powerful and intriguing metaphors throughout the text of the book. CA: I am working on several at this time. I am working on a book about another one of my favorite Heroes, Bellerophon. I’m also working on a book about the religious life of my wife and I, leading up to our conversion to Hellenism and the defining years after. On the back burner, I am also working on a book concerning the wisdom and truths of Hellenism and a publication on Hellenism for beginners. EHS: Which bookfairs, conventions, or other events will you be attending in the foreseeable future? CA: Whichever ones will have me and that are within driving distance. In the past, I made an appearance with my works at Eclectic By Nature in Greensboro, North Carolina. But I’m a small-time writer at this point. If my works become more and more recognized and valued in the community, I am sure I will be making a lot more trips to places.